Hi! I'm Nadia and I founded Sweet Pillar™ to continue my family's Middle Eastern traditions from Damascus. It's been quite a journey starting this food company especially with no history of formal food training. I get a lot of questions via email and figure it would be best to be more accessible. If you have any questions about how to start a food company, what camera I use for my photos, where to find Sweet Pillar™ products, or if you just want to comment and encourage/ motivate/ inspire me this is the place to do it! Thank you so much for visiting my page. 🍴Red tomato chutney🍴 Favors at my cousins wedding, handmade by the brides mother using a traditional English recipe. Working on getting the recipe for you guys because it tasted amazing! A savory chutney with the perfect touch of sweetness 👌🏻 Does anyone have a good tomato chutney recipe ? Follow me on Pinterest for more recipes like this chicken and potatoes in lemon garlic sauce! I originally did this post for EZPZ meals a few weeks back (http://www.eazypeazymealz.com/juicy-baked-chicken-potatoes-in-mouthering-lemon-garlic-sauce/) and I've made this dish so many times since!! The potatoes in this dish are everything! And there is a actual secret that makes the potatos in this chicken & potato dish different than any other chicken and potato dish you've tried! This particular dish has always been a family favorite and of course everyone fights over the potatoes. Once you know the secret to why the potatoes are so amazing you'll understand why my mom couldn't simply add more potatoes to satisfy everyone. If it was going to be amazing, there had to be limited potatoes and they were hot commodity. Funnily enough, the secret to this dish is a trick that I didn't even know was a trick! The first time I made this dish, not realizing there is method to the madness, I didn't stay true to the trick and the results were off. The placement of the potatoes is the trick! 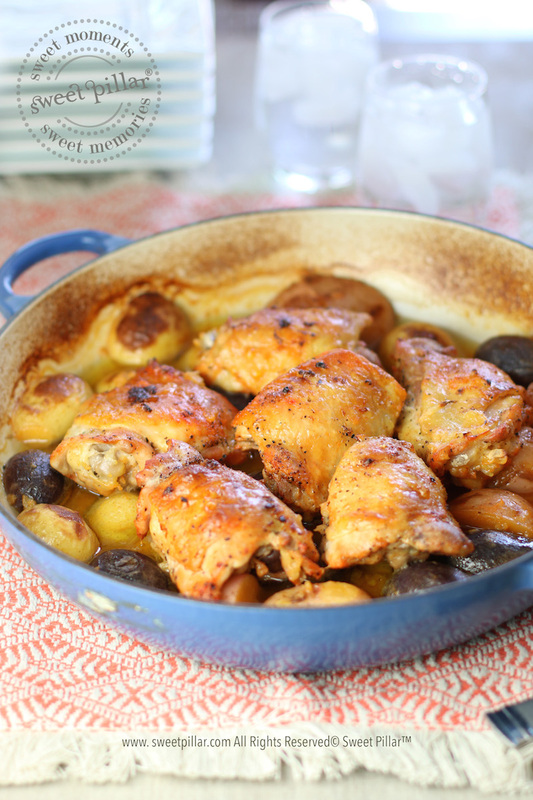 Placing the potatoes at the bottom of the pan makes them so flavorful and juicy because they are pressed down by the weight of the chicken and absorb all the juice from the chicken and the garlic lemon sauce. A side of rice is usually served with this but a side of salad is just as great! I like to broil on high for 3-5 minutes at the end to give it the skin that nice golden crisp but thats optional of course!